Focus Pacific Australasia has lodged a development application for Townsville’s first high-end hotel in decades. The plans feature a DoubleTree by Hilton Hotel which will stand seven storeys high and include 166 rooms, a pool, fine dining, a bar, gym and meeting rooms. Townsville Mayor Jenny Hill said the development application showed that the Townsville 2020 masterplan was providing businesses with certainty to invest. “Townsville 2020 is all about providing a clear vision for our city’s future to providing confidence to businesses and residents,” Cr Hill said. “The Stadium Precinct is a key component of our vision for the future of the city and it is already taking shape with the North Queensland Stadium coming out of the ground. 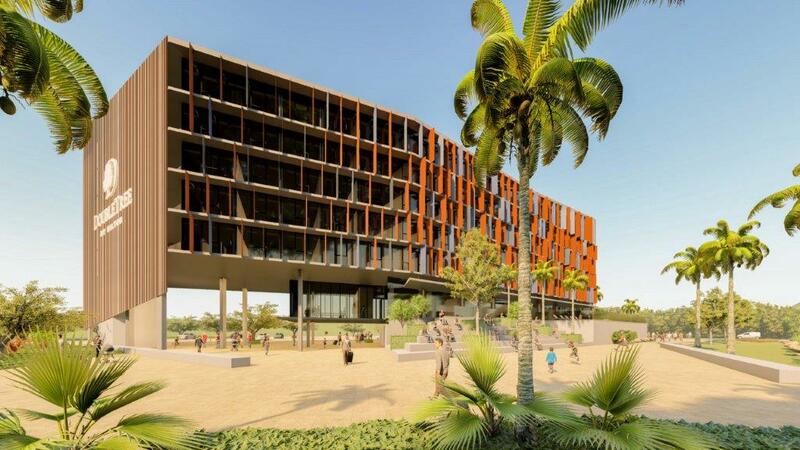 The design – by acclaimed architects Bureau Proberts – places the hotel firmly within the Townsville Stadium Precinct, ensuring easy pedestrian access to the stadium, Central Park, the CBD and Bus Hub. If approved, construction is expected to commence next year with the hotel proposed to be fully operational during the 2020 NRL season.